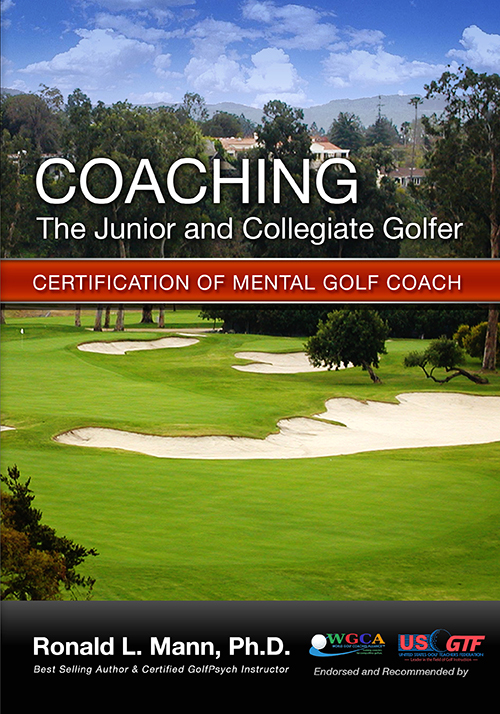 This training program is to become a Certified Mental Golf Coach with an emphasis on junior and collegiate golfers. Are you a professional high school, college or private golf coach? Are you a counseling professional who wants to expand your client base? Are you looking for an Online Certification Training Program to become a Mental Golf Coach? Would you like to enhance your professional training and credentials and become proficient in coaching the mental game for competitive play? Would you like to have more knowledge and skill on how to select and develop winning teams? My favorite chapter, Chapter 9. Yogic Breathing. A perfect breath exercise that allows you to step into the Peak Performance Focus Zone and smack that ball to the flag effortlessly. Ron’s work is deep and wide. I think this online certification is a must for any age golfer who wants to use a more holistic approach to create a winning golf game. Penny PulzRanked Top 10 LPGA golfer in the world with 2 LPGA wins and named twice as a Top 50 Teacher. This is a must read for anyone wanting to enhance his or her coaching skills for the mental game of golf. It is comprehensive and goes deep into the issues that create mental toughness in competition. I plan to use this material in our mental golf coaching certification courses here in China. Dr. Ron Mann’s enlightened research and views have provided me with the tools and techniques that have guided me in a direction of self-exploration and self-management; resulting in greater performance in the extreme pressure of competition. Coaching the Junior and Collegiate Golfer is a powerful book about strengthening the mental game and self-mastery. I have over 20 years of experience in physical therapy with kids and adults, athletes and dancers. I know how much the mind can affect the body for peak performance and recovery from injuries. Fear, negativity, doubt, and lack of faith in oneself are the mental pitfalls that keep us all from being our best. Dr. Mann’s book is filled with fantastic information to help anyone of any age gain a more positive mental approach to life and sports. This book can help parents of young athletes gain better insight into their kids and learn the best approaches to support their athletic and personal development. Coaches will find a depth of information to advance their coaching career and skill set. I strongly recommend Coaching the Junior and Collegiate Golfer. This series of training film is designed to take you to the next level. Dr Ron Mann has a strong reputation for taking your game to another level. Over the years he has helped people at all levels to understand not just the physical fundamentals of the game of golf but also the all important mental approach to the game. His scientific approach allows you to break down the components of the game before you participate. Every serious golfer must secure this program and the results will be amazing. Learn from one of the best in the business, Dr. Ron Mann. Ron, I would like to say thank you very much for allowing me to have a copy of your book. Your book is awesome and it covers what I use and items that I wanted to incorporate with my team this year. I will no doubt be putting your book into practice with my team and hopefully it will put us in the right frame of mind when we need to be “In the Moment. Great tools and techniques which will result in greater performances. Will recommend to any age group golfers to help improve their game of golf. Very impressive, cutting edge, informative and insightful! Your line of thinking is right in line with my views and I plan on being more definitive in my teaching the team now that your book is a resource. Would you like to become an expert in any of the following areas? How to build a relationship with the parents of the junior golfer. How to build a relationship with the junior golfer. The key qualities of a good coach. The seven most important issues for the Junior Golfer. How to enhance concentration, focus, and mental strength. How to assess for the 8 traits of champions. How to design goals and an action plan for success. The actual coaching methods to address the seven major mental issues for the junior golfer. The key elements for a preshot routine. How to coach the difficult student. How to create high performance teams. If you are already enrolled, click on the button to return to the course. I am an honorary member of the United States Golf Federation, and a member of the teaching staff for the World Golf Coaches Alliance. They recommend this training program. I am also a certified GolfPsych Instructor. This is a very comprehensive program with 24 Chapters. A total of 8 1/2 hours of video or all information is presented in eBook format for visual learners. If you answered yes to any of these questions, then this online certification training program is perfect for you. I am pleased to announce my new comprehensive training program for coaching the Junior and Collegiate golfer. This program has a ton of information on how to coach for the mental game for individuals and teams. This program is available as a series of online videos or in iBook or eBook format that you can watch or read at your convenience. There are in HD and streamed to your computer or iPad. Now in two great formats for visual and auditory learners. Interactive iBook for iPad and Mac computers, and PDF version for everything else. This is a very comprehensive program with 24 Chapters. A total of 8 1/2 hours of video or in iBook and PDF format. This is an advanced training program for those wanting real expertise and certification. 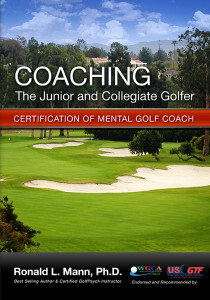 You will become a Certified Mental Golf Coach with the successful completion of this course. This is an interview I did for Fox Sports Net a few years ago when Tiger was at the top of his career. Tiger is a great teacher for all of us about the power of the mental game and the importance of personal mastery for peak performance. You can view Chapter Three in video format and see an overview for the entire course. Here is a chapter you can read from the eBook. Here is a brief quiz to discover if you might benefit from this training program for the mental game? Are there more “no” answers than “yes”? If your student gets really angry on the course during competition, do you know why that is happening and how to show him/her how to remove cause of the emotional reaction? If your student has negative self-talk, do you know why that is happening and how to help your student stop that inner dialogue? If your student has poor concentration and is often distracted by other players and noise, do you know what techniques are the best and how to teach those techniques for stronger concentration? If your student is breaking down on the last three holes, do you know why and what to do to help them avoid that? If a student is worry about pleasing their parents, do you know how to help him/her and the family address and resolve this issue? If you student is failing their classes and breaking down in competition, do you know how to assess the problem and fix it? If two players on your team don’t like each other and don’t work together well, do you know how to address the problem so the team can function at its best? Do you know how to motivate a player so he/she will want to learn how to master their inner life? Upon completion of this program, you will receive an official certificate of completion and certification. This will help advance your career and professional standing. So, take a look at the video and let me know if you have any questions about this comprehensive training program. 8 1/2 hours of specialized training in High Definition Steaming Video. Divided into 24 manageable chapters. Learn at your own pace. A 250 page eBook for those who are more visual learners. This alone would cost you $1700.00 if we were working individually. Advanced Certification as a specialist in Coaching Junior and Collegiate Golfers. One Hour of Individual Coaching with Dr. Ron Mann. Let’s talk about what you have learned and how to apply this to your students. Special Price Reduction!! Only $99.00. Best Price Ever!! Only $99.00. No Risk. You have 15 days to review the course. You can request a full refund if you are not fully satisfied and have not printed your certificate for certification. No questions asked. Enroll now to access Course Registration Page and Begin Your Learning. Once you enroll, you will be sent the video password that will allow you to access each training video. Remember, you set your password to access the course, we will send you a separate generic password for video access once you have enrolled.